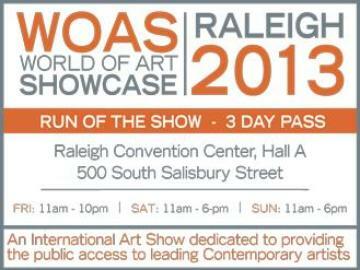 Purchase your tickets in advance now to the World of Art Showcase's WOAS RALEIGH 2013 premier art show. Enjoy access to the daily scheduled artist talks and demos, collector's discussions, tours and marketplace lectures. This ticket provides direct access to the exhibiting artists, their artwork, as well as, any scheduled receptions or live performances. The Run of the Show ticket provides unlimited entrance throughout the duration of WOAS RALEIGH 2013.